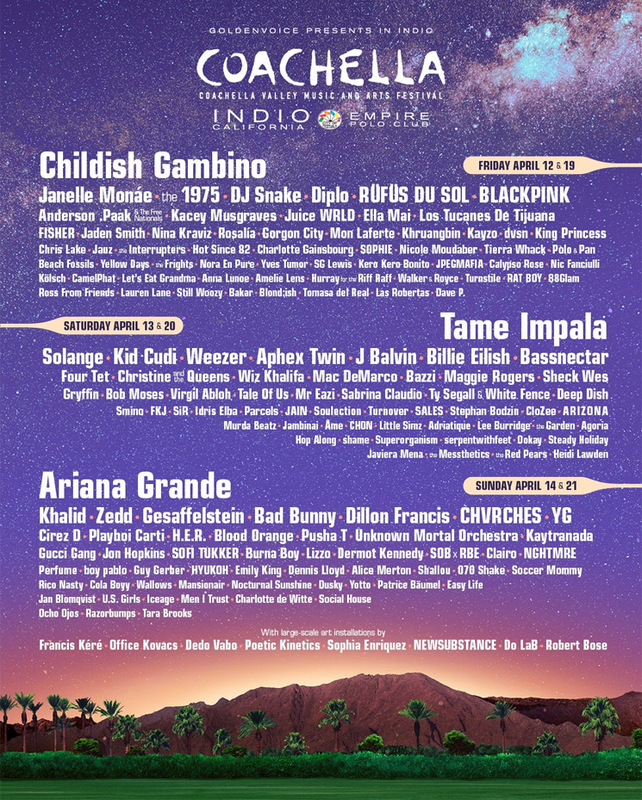 Coachella Valley Music and Arts Festival has announced its full 2019 lineup. This time around the headliners are Childish Gambino, Tame Impala, and Ariana Grande — but not Kanye West. Other artists playing the event include Aphex Twin, Solange, Kid Cudi, Janelle Monáe, the 1975, Pusha-T, Blood Orange, Diplo, Weezer, Kacey Musgraves, SOPHIE, Mac DeMarco, Kaytranada, Anderson .Paak, Juice WRLD, Playboi Carti, Idris Elba, Jon Hopkins, Let's Eat Grandma, Bad Bunny, Sheck Wes, Gesaffelstein, J Balvin, Tierra Whack, 070 Shake, JPEGMAFIA and more. Once again, Coachella returns to the Empire Polo Club in Indio, CA. The first weekend takes place on April 12 to 14 and then for a second weekend from April 19 to 21.